Seniors Tyler Wideman and Kelan Martin are all smiles during Butler’s 82-64 win over Kennesaw State on Nov. 10. Wideman tallied 13 points while Martin led the team with 20. Photo by Jimmy Lafakis. 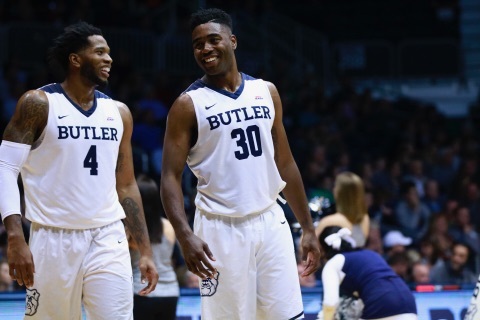 The LaVall Jordan era at Butler began with a bang in the Bulldog’s 82-64 win over Kennesaw State University on Nov. 10. The Bulldog offense exploded in the opening minutes, beginning the game on a 20-4 run. Senior forward Kelan Martin capped off the run with his second three of the game. The Bulldogs scored seven of those 20 points off of Kennesaw State turnovers forced by the Butler defense. While the game looked to be over with Butler leading by 22 in the opening eight minutes, a strong showing by the Owls and a poor shooting streak to begin the second half by the Bulldogs made it a 10 point game with 12 minutes left. The Owls were led in this run by guard ames Scott, who scored 22 second half points to finish with 26. Butler responded with a 12-3 run over the following six minutes to give the Bulldogs a 69-50 lead with just under seven minutes left. Sophomore guard Kamar Baldwin contributed to some of that run after not scoring in the first half. Baldwin finished the game with just seven points after picking up three fouls in the first half. The Bulldogs would ride that final push to the final buzzer for an 18 point victory. While Jordan and the rest of the Bulldogs have been preaching the high-paced offense, the defensive end is what produced the early run. The Bulldogs outscored the Owls 22-2 off of turnovers in the first half. Also, the Bulldogs finished the game outscoring Kennesaw State 12-4 in fast break points. Martin led the team offensively with 20 points. Redshirt junior Paul Jorgensen added 14 points in his first game at Butler after transferring from George Washington University following the 2015-16 season. Points in the paint came relatively easy for the Bulldogs. Butler outscored Kennesaw State 50-16 in the paint, adding 22 layups to their opponents seven. Senior forward Tyler Wideman added a double digit points night with 13. Free throws were a struggle for both teams, particularly for Butler. The Bulldogs finished just 12-23 from the line at 52 percent. Though it did not hurt Butler on the scoreboard, it is an area that was one of their strengths last year. The Bulldogs shot 74 percent on the season from the free throw line a year ago. Another rough area for the Bulldogs was three-point shooting in the second half. Butler finished 1-12 from three in the final 20 minutes. Starting redshirt sophomore guard Sean McDermott went 0-3 from behind the arc, while Baldwin went 1-4 and Jorgensen went 1-4 from distance, respectively. Butler has a quick turnaround to prepare for their next game. They are back in action against Princeton University at Hinkle Fieldhouse on Nov. 12 at 6 p.m. The game will air on the CBS Sports Network.